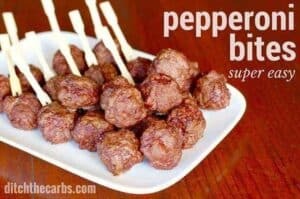 Want to learn the quick way, to prepare easy low-carb snacks for a crowd? 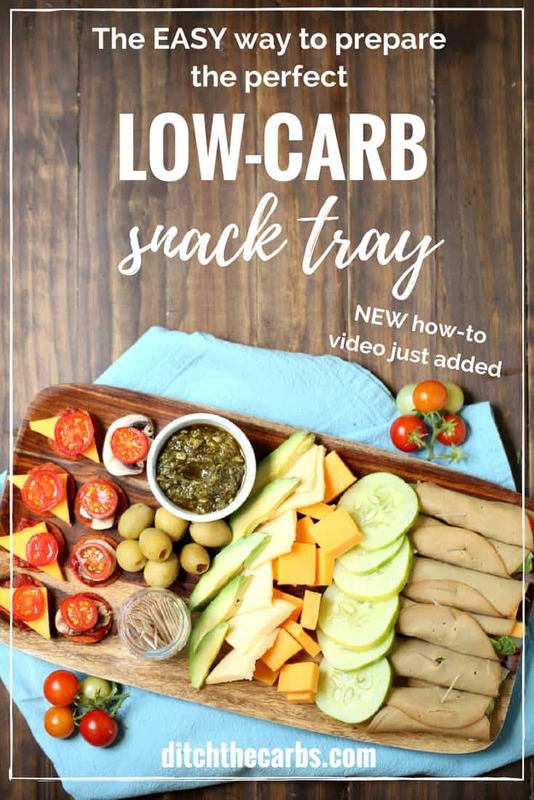 Scroll below to watch the NEW video just added – and learn how to entertain even the most ardent carb-loving guests. 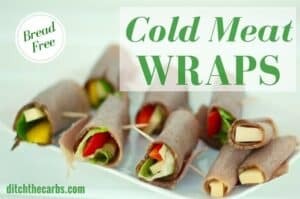 There’s even a grid below showing you my top 12 low-carb snacks, that require a little more preparation, which are prefect for a party all year round. 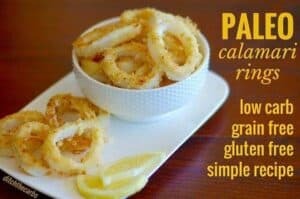 One of my most frequently asked questions on my Facebook page and in my Low-Carb Support Group, is asking me for ideas for easy low-carb snacks. 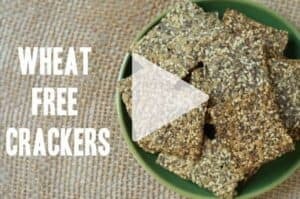 Healthy low-carb snacks really don’t have to be complicated, nor time consuming. A quick trip the the deli counter at your supermarket is your best place to go if you are short on time. Choose cooked meats such as ham off the bone, sliced roast beef, pepperoni and salami. With all meats, choose the best quality you can, with minimal processing and minimal added ingredients. Fresh ingredients such as a variety of cheeses (parmesan, feta, blue cheese, Brie …), olives (black, green or stuffed), avocado, stuffed mini peppers. 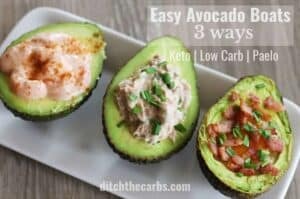 These tasty, low-carb foods are perfect as nibbles and easy low-carb snacks. A Mediterranean-style platter is ideal. 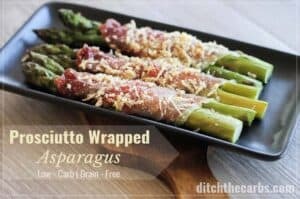 And if you don’t like cooking dinner, why not turn these easy low-carb snacks into a meal? 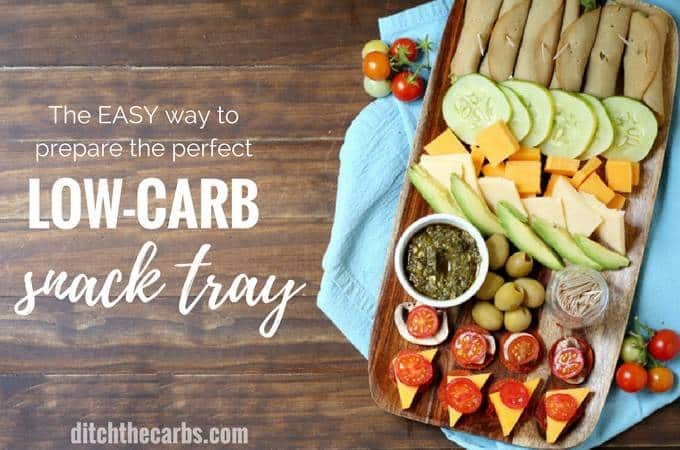 If you are invited to a party, this is the perfect easy low-carb snack tray to bring. 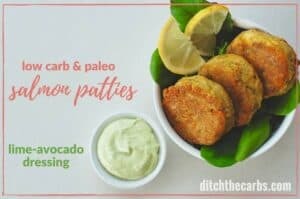 You also know there will be a variety of low-carb snacks (brought by you) that you can enjoy, without resorting to the crisps, bread and high-carb offerings. 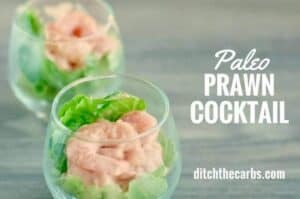 These healthy low-carb snacks require a little more effort, but are still easy enough to pull together for a party. 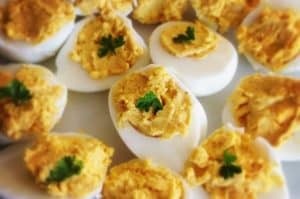 Curried devilled eggs – who can resist? 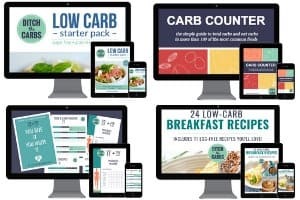 Now if all these days low-carb snacks aren’t quite enough for you, why not take a look at healthy easy low-carb snack finder? 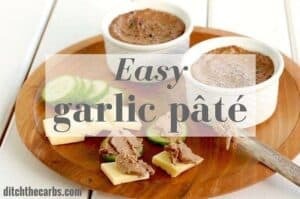 There is sure to be a few more recipes in there that you will fall in love with. 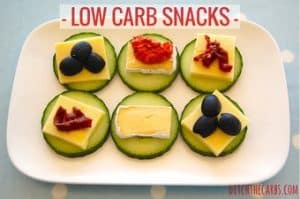 Please leave a comment with your favourite idea for easy low-carb snacks. On the Snack Tray, what is the green dip? How do I make it? And, in the video, what is the red sauce placed on the pepperoni? Thanks! That’s pesto. 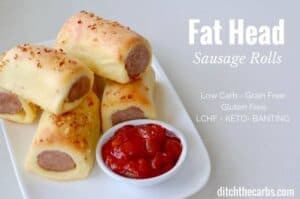 You can make your own using this recipe, or buy store bought. The red paste os tomato paste. It’s so concentrated. you only need a tiny amount. I’m a serious fan of snack trays – and I even use them for meals on a regular basis. They’re such a simple and easy approach to food. I love how you can vary them based on what is in the cupboard and who you are feeding. I probably wouldn’t make the tray exactly as you have pictured it (although it looks amazing). Even so, you’ve given me a few new ideas to try out. Thanks!